Observe an act of kindness. Thank the person for actively caring. Pass the wristband and tell the person to "pass it on." Share your story WITH US!! 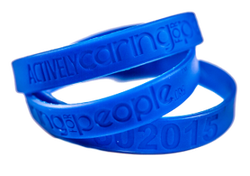 Click here and share your story of giving or receiving a wristband! Throughout the years experts have struggled to define the term “police culture.” For most this label means a reactive approach to keeping people safe by using punitive consequences to punish or detain the perpetrators. The result: More attention is given to the negative reactive side of policing than a positive proactive approach to preventing crime by cultivating an interdependent culture of residents looking out for the safety, health, and well-being of each other. 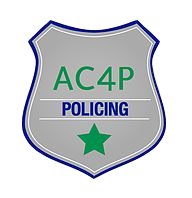 We believe police officers can play a critical and integral role in achieving such a community of compassion — an actively-caring for people (AC4P) culture. Actively Caring for People refers to any behavior that goes above and beyond the call of duty on behalf of the health, safety or welfare of another person. For decades, Dr. Geller, Alumni-Distinguished Professor of Psychology at Virginia Tech, has applied behavioral science to keep people safe at work and on the road by increasing the quantity and quality of AC4P behaviors. In the aftermath of the April 16th, 2007 tragedy, student leaders with Dr. Geller initiated a culture shift at Virginia Tech—the Actively Caring for People Movement. Two thousand green actively-caring wristbands were distributed across the Virginia Tech campus to individuals performing acts of caring with the instructions to pay it forward, by passing on the wristband, when (s)he observes someone else performing an act of kindness. 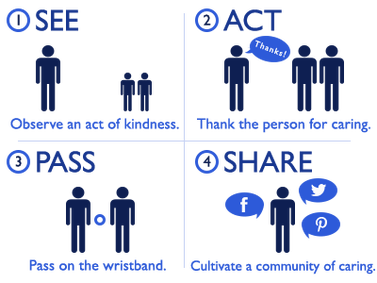 By using the wristband to recognize helping behavior, a tangible reminder of kindness is associated with the feeling of self- transcendence. Everyone has the ability to care for others; all we need is a proactive approach. Most importantly, caring for others is easy. Little sacrifice or deviation from your typical routine is required. It takes only seconds to do someone a favor, but the contagious nature of such acts is undeniable. Through caring for others, as a community, we collectively possess the ability to make an impressive difference in each other’s lives. I challenge you, next time you step out the door, to make someone’s life a little easier. Bringing a smile to a stranger’s face yields a level of fulfillment that is second to none.